Author Kate DiCamillo writes: “I was born in Philadelphia, Pennsylvania, raised in Clermont, Florida, and currently live in Minneapolis, Minnesota. I write for both children and adults and I like to think of myself as a storyteller. “Here are a few more facts about me: I am short. And loud. I hate to cook and love to eat. I am single and childless, but I have lots of friends and I am an aunt to three lovely children (Luke, Roxanne, and Max) and one not so lovely dog (Henry). If you are on Facebook, find Kate DiCamillo at Facebook.com/KateDiCamillo. 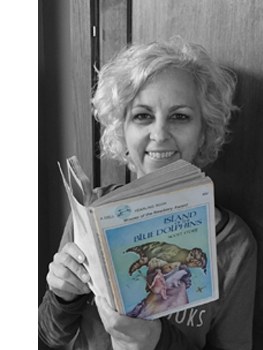 Author Kate DiCamillo recommends Island of the Blue Dolphins (Houghton Mifflin, 1960) by Scott O’Dell as a Great Read for ages 7-12. Check out more Great Reads on thencbla.org.